We have police constantly stopping and searching young black men and arresting them, sometimes multiple times for little or no cause, creating an atmosphere of conflict, and instigating violent responses. Who's to blame? Following the shooting of Michael Brown, protest broke out in the St. Louis suburb of Ferguson, Mo. and were met with heavily armed police officers. On Saturday, Aug. 9, at about noon, Michael Brown was shot by a police officer in Ferguson, Mo., a suburb of St. Louis. Brown, 18, was stopped for walking in the street. He was unarmed at the time. The police claim Brown assaulted the officer and tried to wrest his gun from him, but witnesses say Brown was trying to pry himself from the officer's grasp, who had him by the neck. Chaos ensued. There were protests, a riot, and a police response with military camo, assault rifles, and armored personnel vehicles. Brown's slaying is not an isolated event. The police are heavily armed and aggressive, especially towards young African-American men. The results are dismaying. Young men are killed almost daily in police stop-and-frisk operations and during home raids or routine stops. According to the FBI, police kill young black men on average of twice a week in the United States – in a very limited study to which only four percent of law enforcement agencies contributed. Other studies show that African Americans are disproportionately targeted by police violence in every major city. What's to blame? For starters, police forces are more often using the "broken window" approach to policing. Following the idea that cleaning up minor damage or decay in a neighborhood – a broken window, for example – prevents criminal activity because it shows that people in the neighborhood care about their surroundings and are vigilant, police are going hard after minor criminal activity in the hopes of discouraging more serious crime. The result is that petty criminals – illegal vendors, people with small amounts of drugs, teens walking down the middle of the street – are bearing the brunt of police aggression. For another, New York mayor Rudolf Giuliani's infamous stop-and-frisk policy spurred other departments to do the same, causing forces across the country to target young black men for questioning and searching. In Florida, according to a May Atlantic report, a man in Miami Gardens, Fla., was stopped and questioned 258 times and arrested 62 times for trespassing – at his place of employment. That was part of that city's police policy of stopping and questioning all African-American men between 15 and 30. So now we have police constantly stopping and searching young black men and arresting them, sometimes multiple times for little or no cause, creating an atmosphere of conflict, and instigating violent responses. How did we get here? According to "The New Jim Crow" by Michelle Alexander, this policing is part of a concerted effort to continue to suppress African Americans in the country, picking up where slavery and Jim Crowism left off. Arresting and imprisoning a third of the black male population and thereby stripping them of an economic future and many rights of citizenship, local U.S. governments have in effect pushed back the gains made in the civil rights movement. While that might be a bit too conspiracy-theory-minded for many, there's no denying that promises to crack down on black neighborhoods with police action pays political dividends. Ronald Reagan's "War on Drugs," for example, used the rhetoric of armed conflict to target crack cocaine – a drug more prevalent in poorer African-American communities. George H.W. Bush's infamous Willie Horton ad preyed on whites' fears of black criminals and solidified the support of the Republican Party by blue-collar and suburban whites. The death penalty – where black defendants are nearly twice as likely to be executed as white defendants – still remains popular with voters and politicians alike. The effective response to crime is not increased violent conflict, but better community relations between police and citizens. That's what San Pablo, Calif., discovered. A poor suburb of Oakland and San Francisco, the city of 30,000 recently had the fourth-worst crime rate in the U.S. But in 2013, the city experienced no murders for the first time in over 30 years, thanks in large part to increased foot and bike patrols in the city. Police officers there were rewarded not for arrests, but for positive interactions with everyday people. Nearby Richmond, Calif., also reduced its murder rate by identifying the men most likely to shoot and be shot and giving them assistance for education and work – effectively removing their reasons for resorting to violence. In Kevin Flowers' excellent Erie Times-News June 29 report on 2014 gun violence, he noted that over 200 shootings were reported in the city by mid-June, the majority of which occurred in the eastside neighborhood between Parade and Wayne streets from East Fifth to East Ninth – an "impoverished" section of the city that's predominantly non-white. The Erie police, to their credit, have responded by using federal grant money to increase patrols in the area and understand locals' concerns. Still, area residents remain suspicious of the police – and maybe rightfully so. It hasn't been that long since Erie police patrolman James Cousins mocked a black murder victim ("one less drug dealer!" he said of a man with no history of drug violation) in a drunken rant posted on YouTube for which he received only a 10-day suspension. Three years later, only four of Erie's 173-officer force are African American. And Erie County's community-police anti-violence initiative – UnifiedErie – has no African Americans on its steering committee. 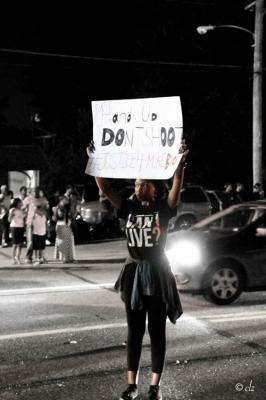 Ferguson's Michael Brown was shot for walking down the middle of a street. Hopefully Erie's police can avoid the cycle of conflict and violence that has marked too many other police forces.